No matter if you are new to the area or not, it is always good to find a friend. Someone to connect with, share laughs, coffee, wine and stories. Who knows where this friendship can take you? Together we are stronger. 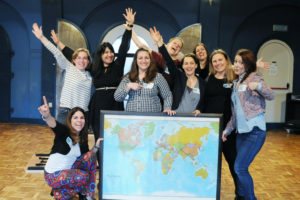 Follow our FB page Arnhem Together for information about upcoming events for Connecting Women. We have lots in store, so make sure you subscribe now so that you don’t miss out. To get a taste of what we have up our sleeve: Socialising events, Girls Night Out, Lectures and Coaching, Coffee Mornings, Networking Events, Dutch / English Cafe and more. Come meet some wonderful people at our LAUNCH on 26th May, 2018 in Arnhem. Send us an email at info@arnhemtogether.nl to reserve your spot. Inspiring Breakfast Morning coming to you this August and November.